Discharges drums of non-corrosive Aluminum Isopropoxide into a tank at 36” above floor level. Carbon steel tubular frame with continuous TIG welds. 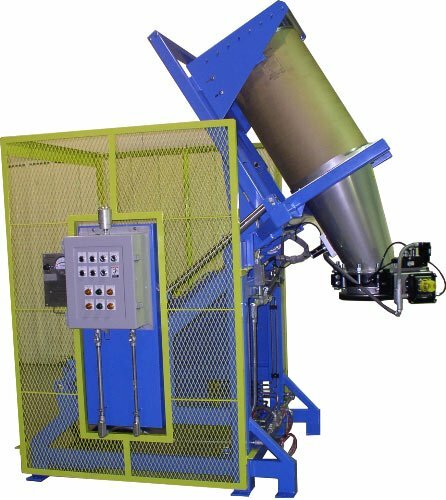 MTS Lift & Seal System™ seals drum to a 304-2b stainless steel pour cone for dust-tight operation. Pour cone includes flange to accept an existing 12” Posi-flate butterfly valve. Expanded metal guards on two (2) sides of the unit painted Safety Yellow.